Huawei Consumer Business Group today announced that the company has received an overwhelming response on the ‘notify me’ for its recently launched HUAWEI Watch GT, a revolutionary long-battery life smartwatch. The company has set new standards in the smartwatch category on amazon.in. Featuring the classic wristwatch design, HUAWEI WATCH GT is one of the most critically acclaimed wearables of the year globally and is available for purchase starting today exclusively on Amazon.in. HUAWEI WATCH GT places its focus on urban explorers who are keen on exploring, pursue quality of life or are interested in new technology products, so as to provide users with outdoor smart sports products with longer endurance, better performance and enriched practical functions. It will be available for purchase starting today at INR 16990 for Classic Edition & INR 15,990 for Sports Edition. Early bird customers would get HUAWEI Sport BT AM61 Earphones worth INR 2999 free along with the HUAWEI WATCH GT on no-cost EMI of 3 months, 6 months & 9 months on a majority of leading banks in India. Enhancing the HUAWEI ecosystem in India, the watch features a thin, exquisite and elegant design for urban explorers. The smart watch body incorporates a dual-crown design with stainless steel and ceramic bezels, and is treated with a DLC diamond carbon coating to provide users with durability that will last for decades. 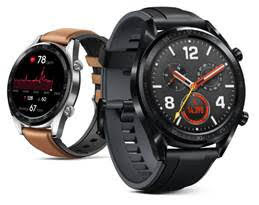 It features a jade-like and fantastic texture, as well as unique and elegant design which is compatible with two band options—a dual-colour silicone band and an elegant leather-rubber band—giving users more choices to customize their HUAWEI WATCH GT for any occasion.